Used machinery, reconditioned metalworking machinery since 1981. 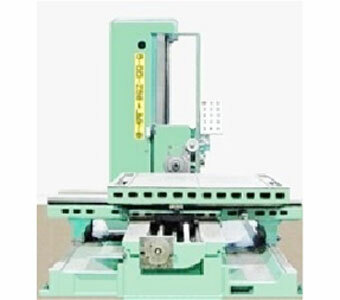 Used metalworking machinery, best source available! All Types of Metalworking and Fabricating Machinery. Metalworking Machinery: We've been dealing in used and reconditioned metalworking machinery since 1981, beginning in Tennessee and later moving to Florida in 2001. We've had the privilege of providing machinery to manufacturers of all sizes in All Fifty States and Canada. Though we specialize in the above eight types of metalworking machinery, we do also provide many other types of metalworking machinery. We've sold cnc machining centers, drills, key seaters, lathes, millers, jig grinders, plate bending rolls, saws, straightening presses. If time permits, explore our website and see for yourself all of the used and reconditioned machinery we have to offer. Blanchard Rotary Surface Grinders: We've been selling both used and reconditioned Blanchard grinders for well over thirty five years. 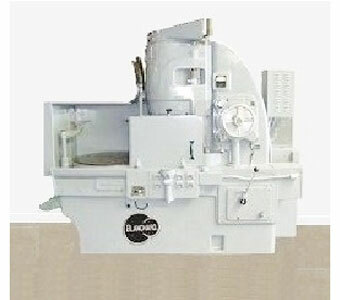 Blanchard rotary surface grinders, have been in use since the early 1900's. When accuracy of parallelism and flatness are required, an engineer will usually specify Blanchard grinding of a part. Due to the basic design of a Blanchard type grinder, it inherently compensates for much of the wear within itself and that of the grinding wheel as the magnetic chuck and the grinding wheel rotate in opposite directions on the same axis or plane. An experienced operator can often hold reasonably close tolerances with even a worn out Blanchard, when using proper technique. We look forward to filling your Blanchard grinder needs. 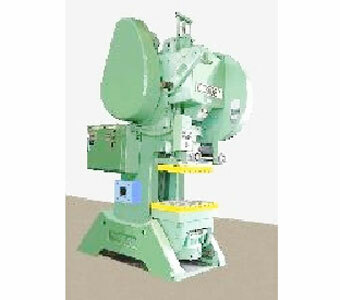 Horizontal Boring Mills: We've been providing horizontal boring mills since 1981, quality low hour machines. For over a hundred and fifty years, boring mills of some form have been in use. In the beginning, they were very primitive and mostly used in the boring of larger gun barrels. They are now used not only in boring applications but also for milling, drilling, tapping and threading of large parts. Mills equipped with a tailstock allow the operator to do long boring operations and still hold close tolerances. Mills with a rotary table allow parts to be rotated, allowing machining of multiple sides of parts without having to reposition the parts. Mills with a facing head allow facing of larger surface areas, or perhaps the end of a large pipe. Considering your individual needs, we are looking forward to selling you just the right horizontal boring mill. 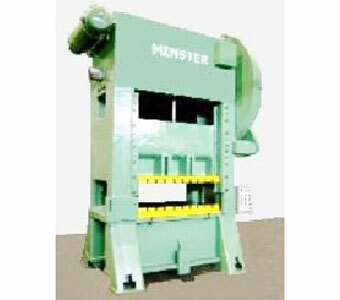 OBI & Gap Frame Presses: We provide both OBI and Gap presses, used and reconditioned. If you're in the market for a press of either type, you have come to the right website. There are now numerous manufacturers of both obi and gap presses. We sell Aida, Bliss, Clearing, Komatsu, Minster and Niagara. Minster is still the most popular brand but Bliss runs a close second place. Aida and Komatsu brands are also very popular these days as well. 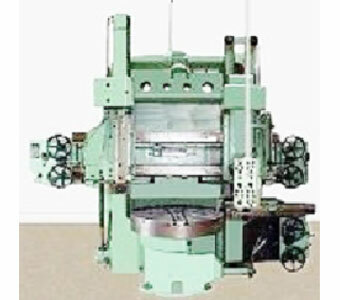 Obi and gap frame type presses are built as single or double crank depending on bed width, tonnage etc. OBI presses are offered as flywheel types or back geared types. The flywheel type is the most popular due to the extra speed provided. We hope you will contact us to discuss your particular needs in your metal stamping application. We are eager to help you in acquiring a late model high quality obi or gap frame press. Power Squaring Shears: We sold our first power squaring shear over thirty five years ago. We sell both mechanical and hydraulic type shears, used and reconditioned. Both mechanical and hydraulic type power squaring shears are widely used today in metal fabrication shops as well as in manufacturing plants. Hydraulic type shears have become the most popular due to their versatility and safety advantages. We specialize in power squaring shears that have a thickness capacity of one quarter inch or more and a width capacity of ten feet or more. Shears in this size/capacity range are where we can save our customers the most time and money because new ones are very expensive and delivery times can be long. We sell all the most popular brands. The key is to choose the right shear for your particular application. Contact us soon so we can sell you the right power squaring shear. 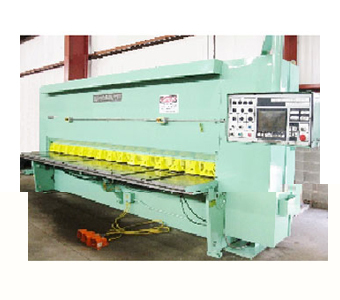 Press Brakes: We offer used and reconditioned press brakes for your metal fabrication shop or manufacturing plant. Hydraulic press brakes are the most popular today due to the versatility they offer, as well as their safety advantages. With today's cnc controls and advanced hydraulics, press brakes are capable of making complex bends with speed and accuracy. We sell all major brands such as Amada, Allsteel, Cincinnati, Dreis and Krump, HTC, LVD, Niagara, Pacific and Wysong. We specialize in press brakes of 135 tons capacity or greater, since this is the capacity range where we will save you, our customer, the most time and money. New press brakes are a bit expensive and delivery times are usually several months. The savings which we will typically provide with a used or reconditioned brake can be substantial. Contact us today, so we can save you time and money on a quality press brake. Reciprocating Surface Grinders: We offer and sell all sizes and brands of surface grinders, used and reconditioned. Reciprocating surface grinders with horizontal spindle are for sure, a basic component of virtually every machine shop now as well as maintenance departments of manufacturing plants. It would be difficult to find a machine shop or a maintenance shop that didn't have at least one surface grinder. We sell popular brands such as Acer, Brown & Sharpe, Boyar Shultz, Chevalier, Do-All, Elb, Gallmeyer & Livingston, Kent, Mattison, Okamoto, Parker-Majestic, and Thompson. Among the smaller and medium size grinders, Okamotos are presently the most popular; Supertech is an up and coming brand also. Among larger grinders, Mattison is the most popular brand. In all size grinders, we especially try to have available ones with incremental down-feed as this feature is very much in demand. 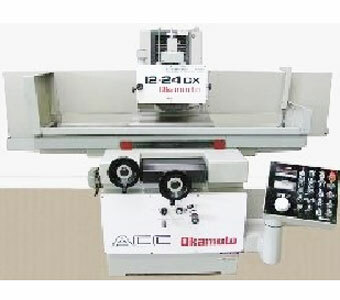 Contact us now, for a quality reciprocating surface grinder. 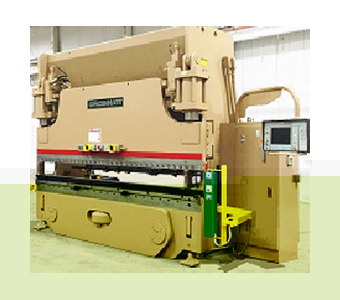 Straight Side Stamping Presses: Finding a straight side press with the right bed, stroke, speed, shut height and window size, is not easy these days, not to mention, finding a certain brand. We work hard helping people acquire the press they want. There are now several popular brands of straight side stamping presses like Aida, Bliss, Clearing, Komatsu, Stamtec, Verson and of course, Minster, the most popular brand. We invest a lot of time in search of Minster presses; though it has become more and more of a challenge locating them, especially those with all the specs that most buyers want. Regardless of brand, it is our goal to buy stamping presses that have been well maintained and ones with relatively low hours on them. Once we find presses of this caliber, we are sure we can offer you the customer, top quality presses that will serve you well in your stamping operation. Send us an email or give us a call if you're in the market for a used or reconditioned straight side stamping press. Vertical Boring Mills / Vertical Turret Lathes: We provide used and reconditioned vertical boring mills and "VTLs" of all sizes and brands. We sell all major brands like G&L, Bullard, King, Gray, Betts, Dorries, Tos, Froriep, Skoda, Niles, Shibaura, Cincinnati, and Webster & Bennett. Bullard CutMasters, are surely popular in smaller to medium size machines. We continuously search for them and normally have them available. Many of the late model vertical boring mills and VTLs have now been converted to cnc, making it very difficult to locate good late model manual machines. We therefore, invest a lot of time and travel in search of desirable manual machines. If you're now in the market to buy a vertical boring mill, let us know the chuck size, height under the rail, type of work heads and other things needed. We'll do our best to provide you with a first class used or reconditioned vertical boring mill or VTL. In Conclusion, we now specialize in the above eight types of machinery in addition to all the other numerous types of metalworking machinery. Do contact us any time you're in search of used or reconditioned metal working machinery.